Who doesn’t love Nutella? If you answered, “Me,” then I don’t trust you. There’s got to be something wrong with anyone who doesn’t love Nutella. The best Nutella I ever had was in Italy. My husband and I were in Venice and stayed at this gorgeous bed and breakfast called Locanda Orseolo right by San Marco. I ordered the Nutella crepes for breakfast each morning because, well, NUTELLA! But the Nutella was different there than it is here in the states. It was a little thinner and creamier and a tiny bit better. Those crepes were incredible and I still think about them, eight years later. I love everything Nutella. 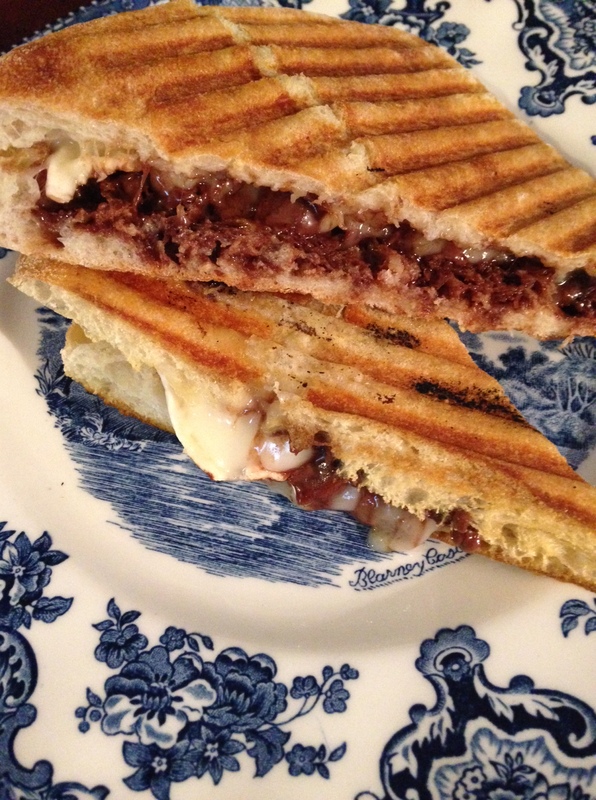 There’s a new panini place where I live, Pressed Panini Bar, and they have this Nutella and brie panini. I tried it awhile back and it was pretty delicious. Brie is great paired with some sweetness and the savory and sweet combination is wonderful. I recently decided to try my hand at my own Nutella and brie panini. It turned out perfect. Nutella and brie on ciabatta bread. Slice ciabatta bread and spread Nutella on one side. Do not load it down too much, remember it’s going to melt and thin. Avoid spreading all the way into the bread corners. Sprinkle a little fleur de sel or regular seat salt on Nutella and then top with a slice of brie (either remove or retain the rind, as you prefer). Top with the top slice of bread and put it on the panini press until desired toastiness.